← Day 38: Massive Pillow Fight. A few weeks ago, I made a trip to Costco with my brother. Since I don’t have my own membership, these excursions tend to be a bit of a rarity, and usually turn into a case of ‘unleash the hounds!‘, with the two things I went in for magically morphing into twenty. Since then, every time I have entered my kitchen, I’ve been faced with this ginormous bag of lemons, wondering what the heck I’m going to do with them, even though at the time it just seemed so obvious that I needed them – urgently! 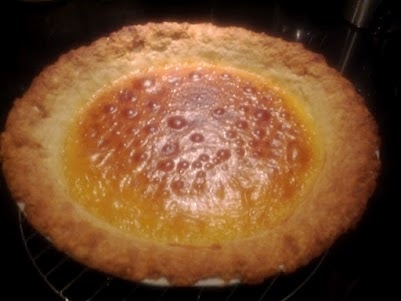 So when some friends called to organize a bit of a pot luck Easter dinner, making a tarte au citron from scratch for dessert seemed like the obvious choice. This is a French dessert full of lemony goodness that I simply adore. It’s basically just lemon pie, but it sounds so much more exotic and decadent when pronounced en français. Now, I used to bake quite a lot, particularly as a teenager, so I sort of know my way around baked goods; however, when it comes to pie, besides pumpkin for some reason, it’s like my personal kryptonite. But of course, I didn’t remember that at the time. All I could think was, a tarte’s gotta be good for at least half a dozen lemons, right? Excellent! So first thing this morning, I made the dough for the crust and got it into the fridge to chill for a few hours before heading to yoga. This took all of half an hour, and went reasonably well. So far, so good. No cheese in this cloth. I want a refund. Pie crust cooked to LaLa perfection-ish. 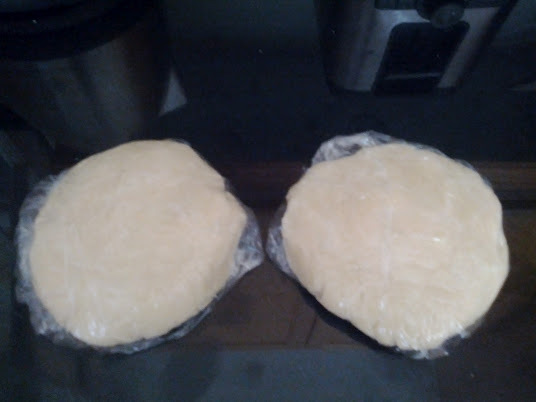 Later on, I miraculously rolled out the dough into a circular shape rather than the usual ink blot, and got it ready for the oven. The recipe suggested filling it first with dried beans. 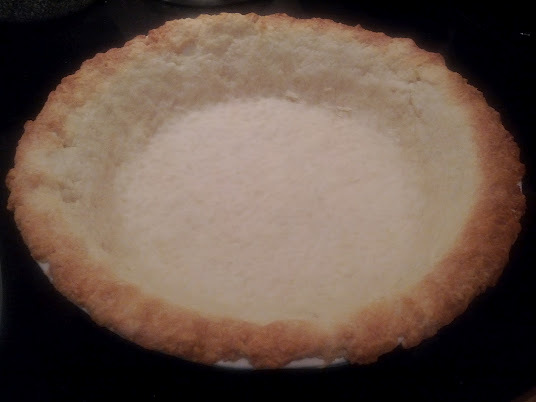 It seemed a bit strange to me to just pour them loosely into the pie shell, so I poured them into cheesecloth, thinking that would make it substantially easier to get them out. 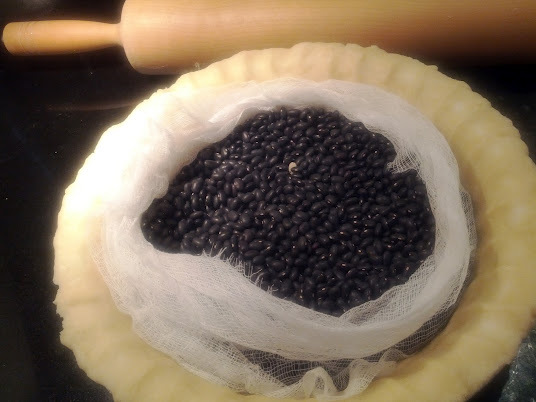 When I pulled the crust out later to take remove the beans, I noticed that it’s tricky to get them out of untied cheesecloth, and that some of it had stuck to the shell. Not a big deal, I dumped the beans onto a cookie sheet and I picked out the cloth bits. Fine. Pie crust went back in for another few minutes. The other thing I realized is that the crust on top of the dish is too thin and so it had already gone quite brown. Whatever, it’s crust – it’s supposed to be, well, crusty. I can live with that. End result seemed fine. Moving on. Next step involved prepping the lovely lemony bits. I needed to get 2/3 of a cup of lemon juice, so I started juicing them by hand. About 3 lemons in, it occurred to me that the recipe also called for lemon zest, and it is significantly easier to zest a lemon than it is an empty flaccid lemon skin. Crappity crap. 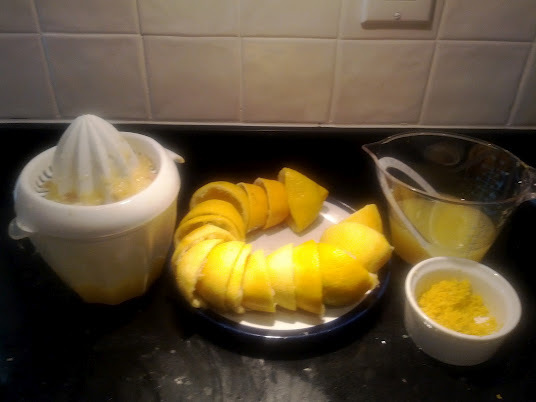 So I started zesting, and only barely removed the slightest layer of skin from each thumb in the process. Not too shabby, really. Finally, it was time for the filling. 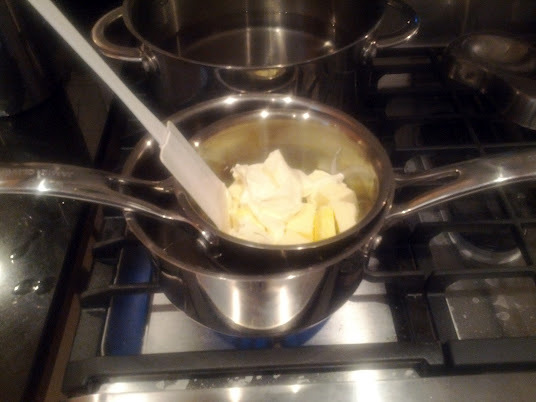 The recipe called for a double boiler – not once, but twice. Doh! Thanks to Jamie Oliver, we don’t have one of those, so I improvised. Incredibly, the lemony liquid gold seemed to survive these less than favourable conditions. 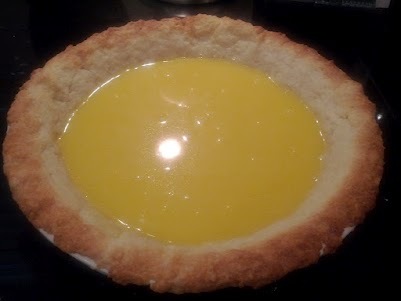 I poured it all into the shell, and presto – it almost sort of looked like a real tarte au citron. Cool! Just call me a double boiler. Except, of course, that the crust was way too high and the pan too wide, but whatever… Details. I was feeling pretty good. Into the oven it went, and I started to tidy up. A few minutes later, I could smell something baking, so I thought, great, I must be on the right track. A few minutes after that, I actually looked at the pie in the oven, and that was when I realized it was already very dark brown on top, and bubbling, with at least 10 minutes of minimum cooking time to go. Feck!! The oven was too hot. Stupid pie. In any event, I managed to keep it from setting off the smoke detector, while still ensuring that the inside somehow got cooked. The result looked more or less presentable, so I took it, along with plenty of wine and a teensy backup death by chocolate tart for the host, to ensure at least one of us would end up with a decent dessert tonight. En route, I was having a flashback to the lemon meringue pie I had made as a teenager that turned out to be lemon soup beneath the fluffy meringue spongy goodness. Bless my family, because they still ate it, by the spoonful… in between fits of giggles, of course. Thankfully, today’s version somehow managed to gel and ended up tasting like a pretty smart tarte after all, so crisis averted. I also learned that the top brown layer was like a very thin film, that could have easily been removed just before serving. But the wine told me that was a ridiculous waste of time, and I had to concur, just like making pie from scratch. Bon appetit! 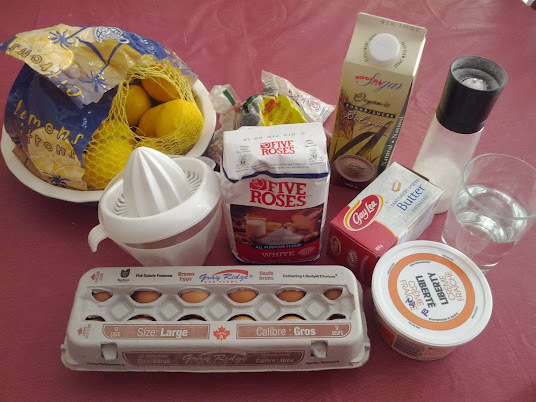 This entry was posted in Food and Drink and tagged April, Costco, Drink, Easter, Food, lemon tart, pie, tarte au citron. Bookmark the permalink. 1 Response to Day 39: Make a Lemon Tart.